Clipping your bird's wings can seem like a daunting task, and indeed it takes patience and practice to master. In the wrong hands, wing clipping can be a bit risky, but if you have a steady hand and are good at following directions, then you should be able to minimize any hazards and do a good job. By following a few simple steps, you can learn to safely clip your own bird's wings at home without having to make frequent vet visits and playing fees to have it done for you. If you feel like you can confidently complete the task yourself, read on for instructions and advice that will help you along the way. Always keep safety as your first priority, however -- if you are unsure of your ability to safely clip your bird's wings, or if you become nervous even in the middle of doing a trim, it's always best to stop and take your bird to an avian veterinarian to have the procedure done. Fetch your bird first aid kit. Although you know you are going to do everything you can to minimize the risk of injury to your bird, accidents can and do occur, and it's better to be safe than sorry! Before you begin clipping your bird's wings, get your bird first aid kit and have it handy nearby. In the event of an unforeseen emergency, it will be helpful for you to have quick access to your bundle of medical supplies. Select a quiet location. Choosing a good location for you to clip your bird's wings will help keep your pet as calm as possible during the process. Try to choose a location away from your bird's cage, away from any loud, sudden noises, and away from the traffic of the household. Removing your bird from areas that they are familiar with will make them less likely to jump or fight while they are getting their wings trimmed, so a quiet spot like a spare bedroom or bathroom is ideal. Recruit help if necessary. 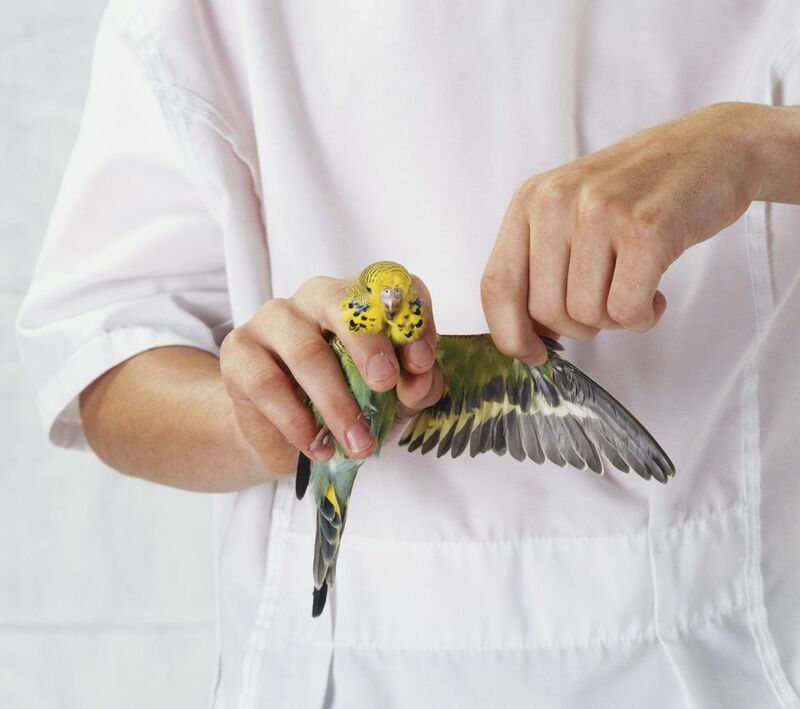 The very first time to clip your bird's wings, and subsequent times until you are confident that you can handle the procedure yourself, it's a good idea to have a friend or family member help restrain your bird for you while you do the trimming. Most wing clipping accidents stem from trying to work on birds that are not properly restrained, so you can minimize a great deal of risk by having a partner help you while you are learning. Restrain your bird using a towel. By "toweling your bird", you will put your bird into a comfortable but secure position so that you can examine the wings and trim the necessary feathers without fear of being bitten or scratched while minimizing the risk that your bird will be able to jump, twist, or lunge. This makes the wing clipping process much safer for all involved. Clip only the primary flight feathers. Different people like different styles of wing-clipping, but in general, the most widely accepted, efficient, and effective method is to clip only the first five primary flight feathers on each of your bird's wings. These feathers, along with an approximate location to start the trim-line, are highlighted in green in the accompanying photo. When trimming the feathers, be sure that you use sharp scissors and avoid cutting into feather shafts that appear dark in color. A dark feather shaft indicates a blood feather, which can cause serious problems if broken or cut. If you do happen to catch a blood feather between your blades, check here to find out how to fix a broken blood feather. Once you are done clipping your bird's wings, place the bird back inside of its cage and allow it to rest for a couple of hours. Wing trims can be very stressful for pet birds, so allowing them time to relax and recoup their strength before any further interaction is imperative. After several sessions, however, your bird should become more used to wing trims, and become more agreeable during and after the procedure. You can re-trim your bird's wings anytime it becomes necessary and you see your bird regaining full flight. In general, this occurs every 4 to 6 weeks as old feathers are molted away and new ones grow in. Each time, even as you become more confident in your wing clipping prowess, keep safety as your top priority. Doing so will ensure that you and your bird will have many more happy times together.